a) The order of matrices is similar. b) The corresponding elements of matrices are similar. a) The order of matrices should be similar. b) Add up corresponding elements altogether. c) The Matrix addition is commutative in nature. d) The Matrix addition is associative in nature. b) Subtract the corresponding elements. c) The Matrix subtraction is not commutative (that is, neither subtraction of real numbers). The scalar is a number, however not a matrix. a) The matrix can be of any order. b) Multiply all the elements in the matrix by scalar. c) The scalar multiplication is commutative. d) The scalar multiplication is also associative. a) The Matrix is of any order. b) Comprises of all zeros. c) Represented by capital O.
d) Additive Identity for the matrices. e) Any matrix plus the zero matrix is an original matrix. a) The number of columns in first matrix should be equivalent to the number of rows in the second matrix. That is, the inner dimensions should be similar. b) The order of product is the number of rows in first matrix by the number of columns in the second matrix. That is, dimensions of the product are of outer dimensions. c) As the number of columns in first matrix is equivalent to the number of rows in the second matrix, you can pair up the entries. d) Each and every element in row i from the first matrix is paired up with the element in the column j from second matrix. e) The element in row i, column j, of the product is made by multiplying such paired elements and concluding them. f) Each and every element in the product is the sum of the products of the elements from rows i of the first matrix and column j of the second matrix. g) There will be n products that are summed up for each and every element in the product. a) Multiplication of the real numbers is. b) The inner dimensions might not agree when the order of matrices are changed. a) As the order (or dimensions) of the matrices do not have to be similar, there might not be corresponding elements to multiply altogether. b) Multiply the rows of first by the columns of the second and add. a) There is no defined procedure for dividing a matrix by the other matrix. b) The matrix might be divided by a scalar. b) Ones on main diagonal. c) Zeros all over else. d) Represented by I. When a subscript is comprised, it is the order of identity matrix. e) I is the multiplicative identity for the matrices. f) Any matrix times the identity matrix is an original matrix. g) Multiplication by identity matrix is commutative, though the order of identity might change. b) You should be careful if factoring common factors to make sure that they are on similar side. AX+BX = (A+B)X and XA + XB = X(A+B) however AX + XB does not factor. a) Just as a product of two matrices is the zero matrix doesn’t mean that one of them was zero matrix. a) When A = B, then AC = BC. This property is still accurate; however the converse is not essentially true. Just since AC = BC doesn’t signifies that A = B.
b) As matrix multiplication is not commutative, you should be careful to either pre-multiply or post-multiply on both sides of equation. That is, When A = B, then AC = BC or CA = CB, however AC ≠ CB. a) You should multiply by the inverse of matrix. The initial attempt to compute f(A) would be to substitute each and every x with an A to obtain f(A) = A2 - 4A + 3. There is one slight difficulty, though. The constant 3 is not a matrix, and you cannot add matrices and scalars altogether. Therefore we multiply the constant by Identity matrix. f(A) = A2 - 4A + 3I. Compute each term in the function and then add them altogether. 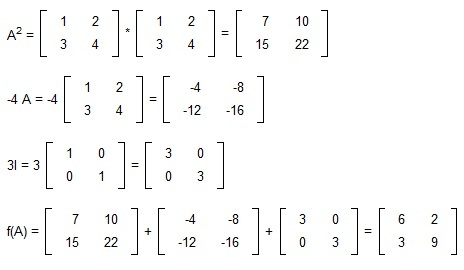 Some of the illustrations of factoring are shown below. Simplify and resolve like normal, however keep in mind that the matrix multiplication is not commutative and there is no matrix division. It is a system of linear equations which can be written as AX = B where A is the coefficient matrix, X is the column vector having the variables and B is the right hand side. When there is more than one system of linear equations with similar coefficient matrix, then we can expand the B matrix to contain more than one column. Place each right hand side to its own column. Matrix multiplication comprises summing a product. It is suitable where you require multiplying things together and then adding. As an illustration, multiplying the number of units by per unit cost will provide the total cost. Units on the product are found by executing unit analysis on the matrices. Labels for the product are labels of the rows of first matrix and the labels of columns of the second matrix. Tutors, at the www.tutorsglobe.com, take pledge to provide full satisfaction and assurance in Algebra help via online tutoring. Students are getting 100% satisfaction by online tutors across the globe. Here you can get homework help for Algebra, project ideas and tutorials. We provide email based Algebra help. You can join us to ask queries 24x7 with live, experienced and qualified online tutors specialized in Algebra. Through Online Tutoring, you would be able to complete your homework or assignments at your home. Tutors at the TutorsGlobe are committed to provide the best quality online tutoring assistance for Algebra Homework help and assignment help services. They use their experience, as they have solved thousands of the Algebra assignments, which may help you to solve your complex issues of Algebra. TutorsGlobe assure for the best quality compliance to your homework. Compromise with quality is not in our dictionary. If we feel that we are not able to provide the homework help as per the deadline or given instruction by the student, we refund the money of the student without any delay.